work with Nodell on the finishing touches. The character made his debut in All-American Comics #16, July, 1940. The published version told of handsome, young Alan Scott, who came into possession of a magic lantern made of a mysterious, green metal. He fashioned a ring from a chunk of the metal, which, if touched against the lantern once every 24 hours, would be charged with a powerful form of energy, able to manipulate any metal object. The only limits were his imagination, and the fact that it was not effective on anything made of wood. He put on a costume that was bizarre even by superhero standards, with a high-collared cape and prominent elements of red, green and purple, and adopted the crime-fighting monicker "Green Lantern". So popular did the feature prove, that a year later, in addition to his monthly billet in All-American, Green Lantern became one of only five DC superheroes of the early 1940s to be published in his own comic. Along with The Flash and Wonder Woman, he appeared regularly on the cover of Comic Cavalcade, an anthology comic that anthologized features from other anthology comics. He was a charter member of The Justice Society of America, along with most of DC's other major headliners. 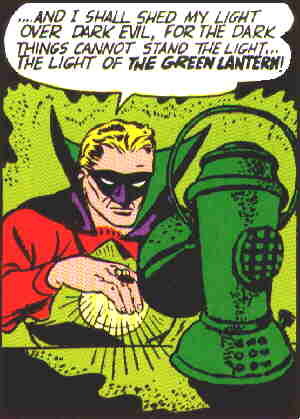 Even within the comics themselves, he inspired the careers of two other superheroes — Wildcat, who had a back-up series in Sensation Comics, decided to put on a costume and fight crime after reading a copy of All-American, and The Red Tornado did the same after hearing her neighbor, Scribbly Jibbet, describe The Lantern's exploits. Several top talents worked on the feature, including Carmine Infantino, who would later draw Adam Strange and an updated version of The Flash; Irwin Hasen, now famous for his work on the newspaper strip Dondi; Alex Toth, the design expert responsible for Space Ghost, among others; and Alfred Bester, who later won a Hugo Award for his science fiction novel The Demolished Man. But even the best array of talent can't make the fickle public stick around when they're ready to move on. The superhero genre went into decline in the late '40s. Comic Cavalcade switched to funny animals, All-American switched to westerns, and Green Lantern's own comic was cancelled in 1949. The Justice Society survived them all, but it, too, was gone by 1951. In 1959, editor Julius Schwartz, fresh from his success with a revival of The Flash, introduced a new version of Green Lantern — this one with more science fictional trappings and less mysticism, and with a less extreme costume. Since then, that one, too, has been replaced. Four years later, the original version was brought back for frequent guest appearances with his more modern counterpart. Since then, it's been posited that he fathered two children who grew up to be superheroes themselves — Jade and Obsidian, both members of the second-generation superhero group Infinity Inc. He slowed down with age, but got youthened through comic book science, and started superheroing again under the name Sentinel. Although the original Green Lantern was never again able to hold down a regular series as such, from that day to this, he has seldom gone long without turning up in one DC comic or another.